"169, Looking out from the mouth of Wolf Creek"
Although not part of the Glen Iris Estate, visitors to the Portage area often journeyed north to see the cascades at Wolf Creek. To take this view the photographer had to descend into the gorge, probably from the far side and cross with a boat - a much easier method than hauling equipment down the Wolf Creek ravine. 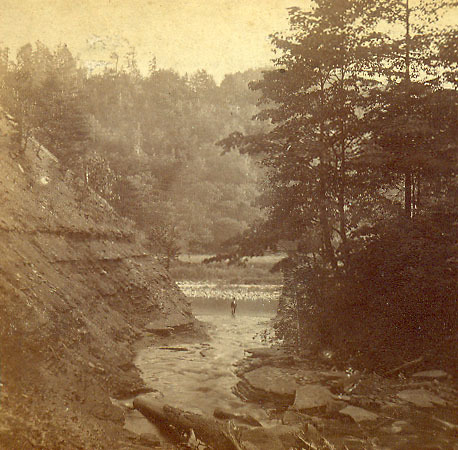 The image is looking east, with the Genesee River visible just beyond the gentleman standing in the creek. See the historic photo album for other views of Wolf Creek. We have also put the back label of this photograph online. See an enlarged image below.